Spring came astonishingly early to Nome this year. By the end of May, the first leaves started to unfold from buds on the tundra willows. That is three weeks earlier than normal! With several days in the +60's and low 70's, it almost felt tropical! Of course, it can still snow several inches. At the mission, excitement is running high at the start of our transmitter building construction. We thank God for your support and your prayers that have made this project, and KNOM's continuing operation, possible Thank you! Top of page OLD FRIENDS: (Right) We were delighted to host Father Paul Macke, SJ in May; Father Paul flew to Nome from Anchorage to conduct a volunteer retreat. Father Paul has many friends in Nome; he was KNOM's executive director in 1979, and later served as pastor of Nome's St. Joseph parish. Also in town, but too late for a photo, was Fr. Chuck Peterson, SJ, who produces KNOM's popular twice-weekly program "The Lord Be With You," which instructs Native village deacons in the upcoming Sunday's liturgical readings. Like Father Paul, Father Chuck is a former Nome pastor and found himself pressed for time, in demand among the many parishioners and friends who wanted to spend some time with him. The grizzly bears are out of hibernation, and a few have been spotted within two miles of Nome. Forty miles north, one ornery griz attacked a pickup truck in a fight that ended in a draw. Meanwhile, just out of town, around a thousand reindeer lazed on the tundra, munching on moss and grasses, and there have been plenty of moose and musk oxen sighted, too. Please remember missions like KNOM in your will. May God bless you! WELCOME to 1973 volunteer Les Brown. Preparing to move to Nome with his wife Paula (a 1973 St. Joseph's Church volunteer), Les flew to town to organize the household; he'll serve with KNOM for the next year. Also in town, another KNOM favorite, Ross Tozzi, who is taking a summer break from the seminary in Mount Angel, Oregon. For Ross, it's an intense working "vacation," as he works on KNOM's financial books and announces two hours a day. Thank you, gentlemen! INSPIRATIONAL SPOT: Scatter love as you scatter seeds - your store stays undiminished, for love makes love as seeds make seeds in a harvest never finished. Do not look to see how your gift fares - it is enough to plant it. Sow love with a lavish hand and take the harvest for granted. Tower expert Rod Ewing (left) begins his 230-foot climb to the top of the KNOM tower to install a 40-foot long antenna for the National Weather Service. The antenna replaced one that failed this past year. (Since July 1977, KNOM has rented space on our tower for their high-frequency public safety broadcasts.) All of the work was paid for by the Weather Service. While in town, Rod also plumbed the tower and adjusted guy wire tension. 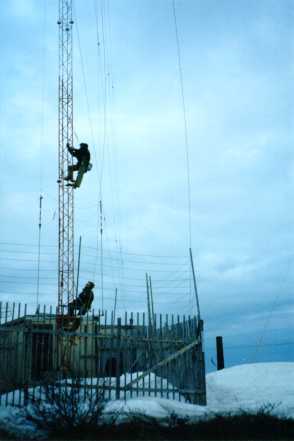 At 27 years old, KNOM's is among the very oldest of guyed radio towers in Alaska. It's still in excellent health, but will require yearly maintenance. First up will be replacement of twelve fiberglas guy wire insulators which have started to fray. Rod, who lives in Wasilla, has promised to fly to Nome in a month or two to replace the insulators one by one. At the right, you can see one of the pilings for the new transmitter building. Incidentally, this photograph was taken at 12:30 AM on May 14th, thanks to light from the midnight sun. In May, authorities asked KNOM to beam out a warning to hunters in small boats out on the open Bering Sea, seeking walrus and seal, traditional foods to feed their families throughout the next winter. The hunting season is extremely short, as the sea ice breaks up and the animals migrate northward. KNOM cautioned them to beware of the hundred-yard-wide shore-fast ice, which had turned dangerously soft and had broken into rotten chunks. Thankfully, everyone returned home safely. Full size(7k) THE OLD HEAVE-HO: Around 1 AM, Rod Ewing (at the top) and worker Curt Ensminger hand-over-hand the first section of Weather Service antenna. 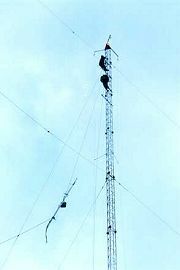 As the antenna reached the top, the wind suddenly lifted to 35 MPH, and with the first piece of antenna bolted solidly in place, they called it quits until the following night. During the short, frantic May herring fishery, a Cessna 180 was spotting fish for a boat about 100 miles due east of Nome. We don't know why, but the plane slammed into the frigid ocean. Its very lucky pilot was rescued by a nearby herring tender.....75 miles NW of Nome, a man was changing oil in his boat's outboard motor when his 2-year-old son picked up a hunting rifle and accidentally shot him in the chin. Incredibly, he was injured only slightly. INSPIRATIONAL SPOT: We welcome spring and the glorious blessings of light. We are rich with light, we are loved by the sun. Let us empty our hearts into the brilliance. Let us pour our darkness into the glorious, forgiving light. For God's loving abundance, let us give thanks and offer our joy. Amen. top of page SOMETHING "TWEET" May and June bring birders to western Alaska, hundreds to isolated Saint Lawrence Island, and thousands to Nome, in search of not only arctic birds, but also "accidentals," Asian birds that goof and wind up on the American side of the Bering Strait. If you're into birds, easy ones include the Green-winged Teal, Semipalminated Plover, Wandering Tattler, Ruddy Turnstone, Long-toed Stint, Hudsonian Godwit, Glaucous-winged Gull, Wilson's Warbler, Lapland Longspur and Hoary Redpoll. If you're lucky, you might see the less common Red-necked Grebe, Peregrin Falcon, Siberian Rubythroat, Violet-green Swallow, Bristle-thighed Curlew or Yellow-rumped Warbler. Extremely uncommon, but occasionally reported are the Mongolian Plover, Buff-breasted Sandpiper and the Blue-winged Teal. The KNOM mission exists to bring God's Love in the form of Catholic inspiration, education and companionship to Eskimo and Athabascan Indian villages throughout 100,000 square miles of wilderness western Alaska. Thank you for making this important work possible. Due to a couple of delays, construction of the new transmitter building is now expected to begin about June 2nd. Look for photos next month! Our Nautel ND-25 transmitter is in the process of manufacture in Bangor, Maine. We're expecting delivery in Nome some time in early July. Right now, general manger Tom Busch is "nailing down" several last minute details, such as the exact model number of the cooling fans and the length of the threaded brass bolt that will carry the signal through the outside wall to the antenna. If there's to be a delay, it will be in the procurement of the high-voltage components for the antenna tuning unit. They're usually available, but occasionally can take two to three months to obtain. We'll keep you informed. Again, sincere and prayerful thanks to all of our mission's friends who have made this wonderful improvement possible. 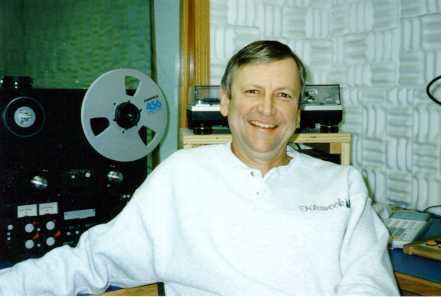 Congratulations to KNOM volunteer production director and morning deejay Paul Rauch, who passed his amateur radio exams in May and is now a licensed Technician with the call sign KL0ID. He joins Tom Busch, KL7HBC, who's held an Advanced license since 1970. INSPIRATIONAL SPOT: Let us live in such a way that when we die, our love will survive and continue to grow. 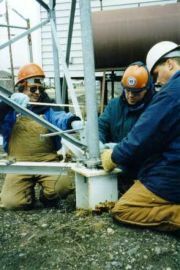 The tower crew (from left) telecommunications contractor Rod Ewing, and workers Curt Ensminger and George Greene slept a few hours after replacing the antenna on KNOM's AM tower, then went right to work plumbing (setting exactly vertical) the 81-foot tower behind the station's Keller Broadcast Center. The tower is adjusted by turning leveling bolts at each of the three legs. BARGING IN: May 29th, the tugboat "Taurus" pulled the immense oceangoing Barge "Naknek Trader" into Nome waters from Seattle. The first barge of spring carried some 300,000 tons of freight: construction material, trucks and groceries for Nome and surrounding villages, and its arrival was cause for celebration. INSPIRATIONAL SPOT: Work as though everything depended on you. Pray as though everything depended on God. Top of page 50 UNEXPLAINED CHILD DEATHS in Alaska each year have caused the State to form an investigative task force. As you know, eliminating abuse, family violence and neglect are among KNOM's highest priorities. May God bless you for your continuing support for our work. Thank you again!